Choosing wood over MDF window shutters? Investigating the many differences between premium quality wood and engineered MDF – it’s not just about cost when it comes to your home. Hardwood furniture has been used in homes for thousands of years. Since early man started using tools and materials to craft, mankind has developed a fascination with wooden items. As a material, wood is incredibly long lasting, with some examples of wooden spears found in Germany shown to be over 300,000 years old. What materials count as a hardwood? What are the advantages of using wood? How much do premium wooden shutters cost? What other wood window treatments are available? As a material, hardwood is unparalleled when it comes to the home. At Shuttercraft we believe it makes perfect window shutters: super stylish, insulating, and exceptionally durable. If you’re considering a new look for the home, hardwood shutters could be just the thing for you. What materials count as hardwood? Tending to be from deciduous trees, there are many different types of hardwood, each with unique properties. Colour, grain pattern, hardness and durability can be incredibly varied, so it’s worth doing your research and checking your hardwood facts before making a purchase. Deciduous trees (those that shed their leaves in winter) are found across most of the world, covering both temperate and tropical climates. Tropical hardwoods tend to be quicker growing, making them a more sustainable choice for furniture production, although their names may not be as familiar in UK homes. Some types of hardwood include: Oak, Mahogany, Birch, Willow, Teak, Elm, Wenge, Cherry, Ebony and Beech. An abbreviation of Medium Density Fibreboard, MDF is a great choice for furniture found throughout the home, such as desks, tables and bookshelves. Made from combining various wood fibres using wax and resin, MDF can be incredibly robust and stable, minimising the risk of warping or twisting caused by fluctuating temperatures. Being manufactured rather than grown, MDF does not feature grain or knots that you would find with natural wood, leaving it with an incredibly smooth finish. Due to its production process, MDF does not have the natural beauty of other materials, so is often painted or coated with wood-effect veneer. As it’s crafted from recycled wood fragments, choosing a premium MDF product such as Antigua helps to save trees though, as with all materials, there are some drawbacks. MDF has susceptibility to water and possible emissions from substances used during manufacturing process. One of the most popular building materials and used for thousands of years, wood is known for being incredibly durable and robust. This helps wooden products maintain an incredible lifespan, making them a better long-term investment than cheaper, off-the-shelf alternatives. Hardwood window treatments are also incredibly traditional, as some of the earliest shutters were simple solid panels, used to block out the weather during colder months. 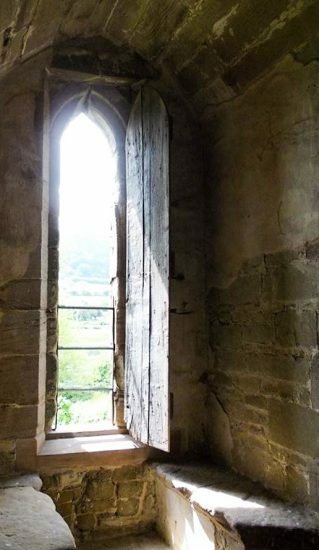 In historic buildings around the country, such as at Stokesay Castle, original window shutters are still in use to block out the elements, showing that such hardwood features can sometimes last hundreds of years. Another advantage of using wood is the appearance. Although it can be painted, the natural beauty of the grain really comes to the fore when choosing a stained finish. At Shuttercraft we recommend the subtle tones of Limed White or Golden Oak as a beautiful accompaniment to most contemporary interiors… or castles! The woods used for Shuttercraft shutters are also treated and tested for certain atmospheric conditions. As a stable material, hardwood is not as affected by climate as MDF, making it more suited to rooms where damp can occasionally be present, although for bathrooms and wet rooms, the fully waterproof Java range would be suitable. If you’re considering a new look for your home, and wondering about a price for hardwood shutters, look no further than your local Shuttercraft. Our UK-wide shutter experts offer a free home consultation and detailed survey, to provide you with the most accurate quote possible. Getting an exact price for your shutters would depend on the hardwood used. For example, robust oak or teak would be more expensive than less well-known materials such as paulownia. Softwoods such as pine may also vary in price, so it’s worth getting an accurate quote from a trusted local expert before you buy. At Shuttercraft we always offer a made-to-measure solution – crafted for your home – so you can be assured of a perfect fit and shutters that will last for years to come, making them a savvy investment for the long term, rather than a cheap off-the-shelf alternative that may need replacing in a matter of months. Helping control the light in a variety of different ways, a wooden window covering like plantation shutters is suited to a range of interior designs but may not be to everyone’s tastes. One of the earliest forms of window covering was a wooden solid panel, and their modern equivalent is available today. Solid panel shutters from Shuttercraft come in either painted or stained finishes, making them a beautiful addition to any home décor, whether classic or contemporary. Another popular choice of wooden window treatment is Venetian blinds. Although there is some historical debate as to where they originated, Venetians appeared in the 1700s, and were quickly adopted in homes across the world, also featuring in artistic works such as James Tissot’s Tea from 1872. Fixed together with material cords and tapes, wooden Venetian blinds such as the PURE Wood range from S:CRAFT can complement shutters, also providing decent light control with movable slats. Their lighter weight and reduced number of securing points does mean that Venetians are not as effective with windows open, being prone to blowing in the wind, rather than fixed to the surroundings themselves. So why should you choose hardwood shutters over an MDF option? Put simply, it will be a sturdier product, built to last, and will be less likely to warp or bend in damper rooms. As important as cost can be, it should never be the sole deciding factor, and at Shuttercraft we know this all too well. Our premium shutters are made-to-measure, meaning you can be assured of a product that will perfectly suit nearly every style of interior. Without making drastic changes to your living space, simply adding wooden shutters can make a significant impact in your home by affecting the levels of light, complementing your existing interior designs and providing privacy in the places you need it most. Find your local Shuttercraft today and let us make light work for your home!